Don't let diabetes come in the way of you and your love for chocolates with this ravishing sugar free dark chocolate, now available in India. Indulge in our absolutely guilt free divinity of 70% rich cocoa made with select handpicked cocoa beans mildly enrobed with Naturally Zero Calorie sweetness of Stevia plant to give you the most luscious chocolate experience that'll leave your taste buds craving for more, we promise! 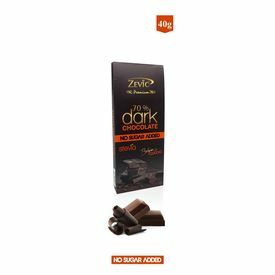 Zevic Sugar Free Dark Belgian Chocolate is the ideal choice for health-conscious chocolate connoisseurs. Key ingredients/Composition : Cocoa solids, cocoa butter, stevia extracts, erythritol, emulsifiers (322, 476). Contains added natural flavoring substances. Don't let diabetes come in the way of you and your love for chocolates with this ravishing sugar free dark chocolate, now available in India. Indulge in our absolutely guilt free divinity of 70% rich cocoa made with select handpicked cocoa beans mildly enrobed with Naturally Zero Calorie sweetness of Stevia plant to give you the most luscious chocolate experience that'll leave your taste buds craving for more, we promise!Zevic Sugar Free Dark Belgian Chocolate is the ideal choice for health-conscious chocolate connoisseurs. Key ingredients/Composition : Cocoa solids, cocoa butter, stevia extracts, erythritol, emulsifiers (322, 476). Contains added natural flavoring substances. We do not add sugar or artificial sweeteners. Safety information/Caution : Keep in cool dry place away from sunlight.